Movie: "The Stanford Prison Experiment"
Dr. Philip Zimbardo creates an experiment to study the psychological effects of the prison system by splitting 24 Stanford University students into two groups of guards and prisoners. 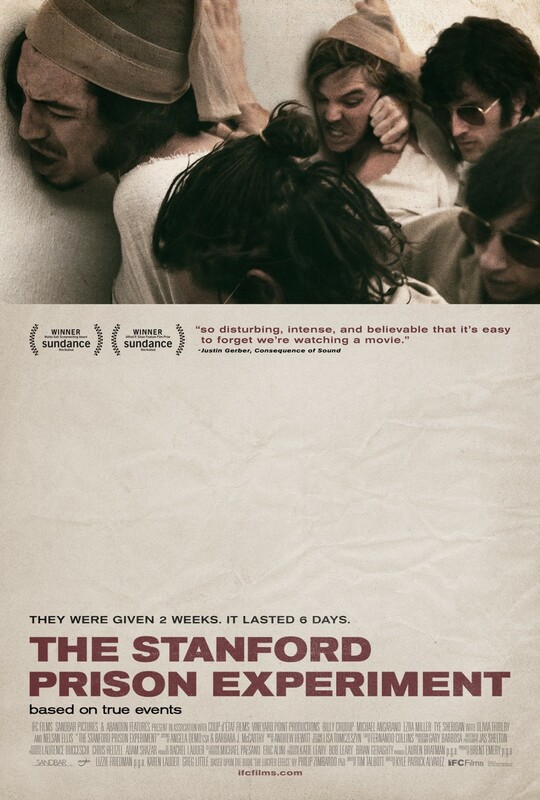 Based on true events, "The Stanford Prison Experiment" is about a study that was conducted at the prestigious Stanford University. It was created in an effort to learn about the psychological effects of imprisonment and empowerment on the average person. It is a case often covered in entry-level college psychology classes to this day as the results were much better than Zimbardo could have ever expected, though his methods were less than proper. This film offers an interesting look at the pack mentality of man, how far some are willing to go when given total authority over others, and how many people will simply and quickly fall in line like sheep. People scratch their heads and wonder how soldiers execute innocent people just like Hitler's Schutzstaffel (SS) did. People question how the guards at Abu Ghraib were able to psychologically torture and humiliate their prisoners with such zeal. Though heavily criticized, "The Stanford Prison Experiment" itself shed some light on how quickly mob mentality takes over in a person's brain. It shows how seemingly normal college students were able to fall into sadistic tendencies and/or have psychological breakdowns within the span of just a few days. The movie is interesting because the experiment was interesting, and it's shocking because the reality of the experiment was shocking. When it comes to the movie version of these events, the technical aspects are all sort of average. The camerawork, dialogue, and cinematography are all competent, but nothing truly stands out as being incredible to us. Michael Angarano, Billy Crudup, and Tye Sheridan put on standout performances, but the rest of the acting is decent, not overly exceptional. Outside of what is borrowed from the original experiment, there isn't anything that's going to really wow you, so "The Stanford Prison Experiment" works best if you have no idea what's coming. That being said, there is nothing particularly disappointing about this film even if you've already heard of the study because it is so fascinating. The movie itself boasts some excellent, often shocking moments and a premise you're not going to forget. It is definitely worth checking out for the insane drama of it all.